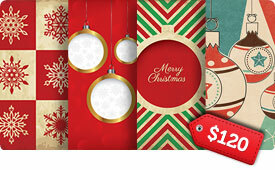 Deck the halls with deals a plenty… fa la la la la, la la la la! Yeah, the holiday season is kicking into high gear now as stores slash their prices. But you’re here at Mighty Deals, you don’t just know a good deal when you see one, you also know great designs! If you’re looking to spread some Christmas cheer around, either through holiday cards, flyers, T-shirts, ads or various websites, then you’ll want to jingle all the way with this sensational offer. It’s not just 1 super-reduced deal. Uh uh. This here Mighty Deal is a collection of 7 fantastic deals in one! 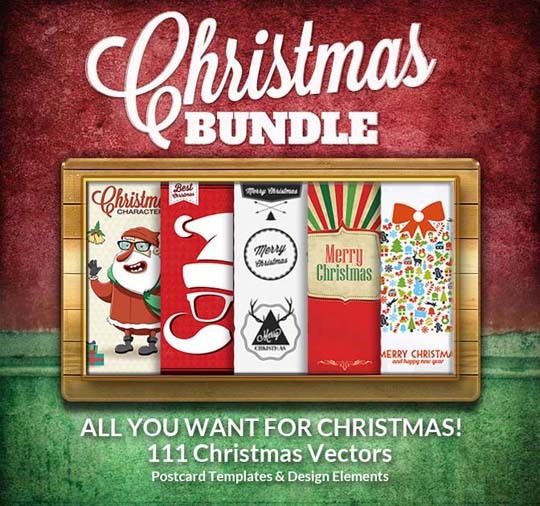 In fact, you’re not just getting a ton of Christmas-themed resources at once, you’re also getting $880-worth of awesomeness for a mere $19! Yeah, that’s a mega 96% off savings to stuff in your stockings! 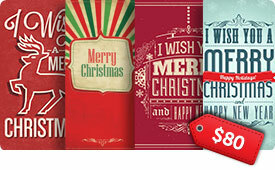 Christmas Typographic Designs – This set of 10 colorful designs features gorgeous typography in an artistic style to help you easily get anyone into the Christmas spirit. Ornaments, reindeer, Christmas trees and more, help make up the professional designs in this collection. 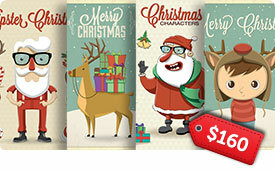 Christmas Character Icons & Designs – An adorable collection of 20 colorful and cartoony Christmas-themed designs and icons. Perfect for holiday cards, backgrounds, advertisements and more! Hand-drawn Christmas Greetings – This professional set of hand-drawn Christmas greetings covers the holiday’s biggest characters including Santa, teddy bears, gifts, ornaments, the North Pole, bells, and more in the Christmas and New Year’s theme. All images are scalable vectors. 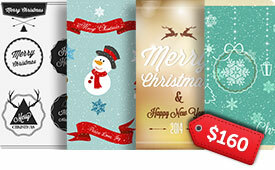 Christmas Design Templates – A beautiful set of Christmas-themed templates perfect for greeting cards. High-quality and professional designs from shiny to vintage styles. Christmas Greeting Templates and Icons – This bright and cheerful collection of Christmas greeting templates and highly stylish icons just screams holiday fun. Features gifts, gingerbread men, stars, Christmas trees and more. 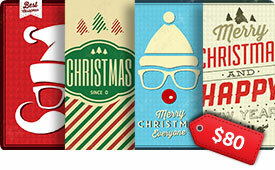 Typographic Christmas Designs – This truly festive collection of typographic Christmas design templates adds a modern-day twist to some quality designs. Get your holiday message across in a unique and stylish way. 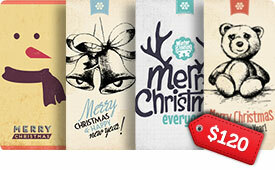 Christmas Designs and Hipster Style Labels – This huge collection of illustrations, designs and labels covers the Christmas season, as well as a variety of hipster-styled graphics. From colorful ornaments to seasons greetings and everything from bicycles to moustaches! Yowza! 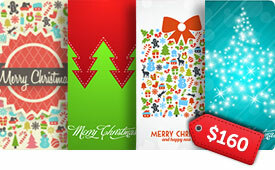 That’s 7 fantastic Christmas-themed bundles in one mammoth Mighty Deal! Good thing these all exist on your computer, because there’s no way this many resources would ever fit under your Christmas tree! Normally, you’d pay $880 for everything featured here, but for a limited time only, you can get all 7 collections for just $19! You read that right, $19! As in 96% off the regular price! Click the BUY NOW button and start jingling those bells!